​Lyric soprano Kelsey Marshaye Blanco holds degrees from New Mexico State University (BME) and Ohio University (MM). 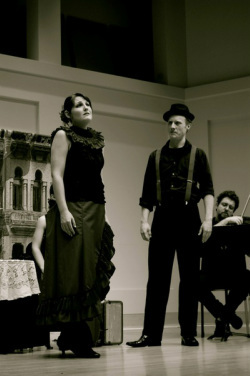 An active performer in both opera and musical theatre, Mrs. Blanco has portrayed the title roles in Astor Piazzolla’s María de Buenos Aires and Mozart’s Bastien und Bastienne as well as performed in Fiddler on the Roof (Golde), Ragtime (Evelyn Nesbit), The 25th Annual Putnam County Spelling Bee (Rona Lisa Perretti), and the world premiere of We Are Enron (Susan Lucas). Mrs. Blanco has also been heard as a concert soloist with the Symphonic Band at Indiana University and Symphony Orchestra at Ohio University. While a brief resident in Maine, she performed with the Casco Bay Wind Symphony and in Opera Maine’s 2017 production of La Traviata. Currently Mrs. Blanco resides in Murray, Kentucky where she has a private voice studio. When not singing or teaching she can be heard on 91.3 WKMS as the host for All Things Considered and Marketplace.